Roger Thornton, Chief Technology Officer of AlienVault, discusses why it is so important to start with cyber security basics and master that before adding all the latest shiny objects available in the InfoSec industry. - Detection and response of a breach is key to effectively mitigate risk for organizations of all sizes. - Democratizing data sharing through Open Threat Exchange to find the bad actors more quickly. - There are different strategic imperatives based on company size, industry and skilled resources. - The AlienVault approach: unified, simplified, democratized. To learn more about AlienVault, go to http://ow.ly/LMKB30kVijd. To join the AlienVault Open Threat Exchange, go to http://ow.ly/MuLJ30kVinb. Roger Thornton is the Chief Technical Officer for AlienVault. Roger’s career has been dedicated to the development of technology and new business ventures based on technical innovation. Over 25 years in the Silicon Valley and abroad, he has driven the formation and growth of dozens of new companies and hundreds of products, serving in a wide range of roles from engineering, marketing, and management, to investor/advisor. Today’s rapidly evolving world means that traditional security measures like firewalls and antivirus are not sufficient to protect a company from a devastating breach. While it’s usually the big companies that make the headlines, the reality is every organization is a target, regardless of size. In fact, attacks are on the rise for small and midsize businesses because most lack the essential security controls necessary to mitigate risk. With a major shortage of skilled resources in today’s cybersecurity market, more and more organizations are opting to outsource key security monitoring services to a managed security service providers (MSSPs). Whether for log management, managed detection and response (MDR), SIEM-as-a-service, or compliance management, organizations large and small are turning to MSSPs to deliver these solutions quickly and cost-effectively. Chris works on Alienvault OTX as a Threat Engineer. He’s had a long interest in security, but joined the industry after winning the civilian section of the Department of Defense's forensics competition. Chris runs a popular threat intelligence portal (ThreatCrowd.org) in his spare time, and holds a CCHIA (Certified Host Intrusion Analyst) from CREST and a degree in Computer Science from the University of Cambridge. The GDPR, or General Data Protection Regulation, will come into force on 25 May 2018 and has spurred many questions for IT teams trying to get up to speed on what the new regulation will require and how to achieve compliance in the most efficient way. - What is GDPR and who is affected? - How will GDPR impact organizations outside the EU? - What is meant by personal data in the context of GDPR? - What are some of the steps and effective tools you need to comply? - What should your incident response plan look like in the event of a breach? - What happens to companies that fail to comply? Implementing effective asset discovery and vulnerability assessment are two of the most important first steps in improving IT security. Before you can protect your environment, you need to understand what assets you have across your cloud and on-premises environments, and be able to identify and prioritize vulnerabilities. Sacha joined AlienVault in Feb 2017, where he is responsible for the technical marketing of the AlienVault Unified Security Management (USM) family of solutions. He brings multiple years of experience from product management, product marketing and business management roles at Microsoft, NetIQ, Gemalto and Schlumberger where he has delivered both SaaS-delivered and boxed-product solutions that address the IT security, identity and management space. Originally from the UK, Sacha is based in Austin, TX. The GDPR, or General Data Privacy Regulation, will come into force on 25 May 2018 and requires organizations to maintain a plan to detect data breaches, regularly evaluate the effectiveness of security practices, and document evidence of compliance. If you don’t already have the required security tools and controls in place, your organization will need to start planning now to achieve compliance and mitigate the risk of high fines for failing to comply. That's where AlienVault can help. In this webcast, AlienVault CISO John McLeod will provide insights into how AlienVault has approached the GDPR compliance process internally, along with how our Unified Security Management (USM) platform can help accelerate and simplify your path to compliance. We'll also provide a brief demo of the USM platform to illustrate some of the technical controls you need in place TODAY for compliance. With the proliferation of single-point security solutions, many IT teams are struggling to efficiently monitor the security of their environments, and respond quickly to threats. It can be a real challenge to juggle multiple tools that weren’t designed to work together, which wastes time and resources that small IT security teams can’t afford to lose. 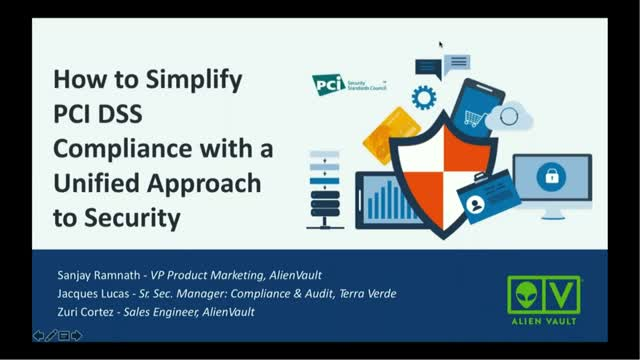 Watch this webcast to learn how one of AlienVault's customers was able to build a security operations center (SOC) on a budget with the AlienVault toolset, and extend security capabilities via the AlienApps ecosystem. Every business that handles personally identifiable data is subject to privacy regulations and standards, such as PCI-DSS for credit card transaction data, HIPAA for medical records privacy, SOC 2 for any organization that delivers services (including SaaS-delivered solutions) and the European Union’s soon-to-be-enacted GDPR (General Data Protection Regulation). There are also privacy and breach disclosure laws that vary from country to country (even state to state in the US), making it a big challenge to keep up with them all. Failure to comply can result in daily penalties and fines, and a data breach resulting from non-compliance could cost millions in settlements, legal fees, and loss of reputation. Join special guest, Divya Jeyachandran of Coalfire and John McLeod, CISO of AlienVault to hear what auditors are looking for and how to best prepare for your next audit. Divya is a Senior Manager in the Payments practice at Coalfire focusing on data security in cloud environments. She advises and assesses client environments to meet security and compliance requirements such as the PCI DSS. With 8 years of experience in cloud technology, IT security and audit, and network and systems administration combined with understanding the applicability of regulatory security and compliance requirements towards IT solutions, Divya has been the lead QSA for some of the major cloud service providers and security service providers in the industry. As you've likely heard, Meltdown and Spectre are vulnerabilities that exist in Intel CPUs built since 1995. Hackers can exploit Meltdown and Spectre to get hold of information stored in the memory of other running programs. This might include passwords stored in a password manager or browser, photos, emails, instant messages and even business-critical documents. Join us for a technical webcast to learn more about these threats, and how the security controls in AlienVault Unified Security Management (USM) can help you mitigate these threats.